Creating a copy of your menu is helpful when you've created an in-house and need to quickly make a takeout version. It's also helpful when creating menus with similar content. To save a copy click the File tab then Save a Copy. 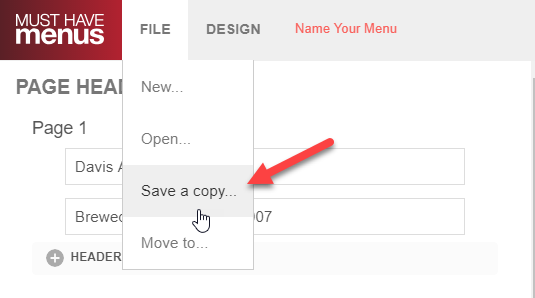 After you name the copy and click save, your original menu will be saved and stored in My Menus. The page will refresh and you will begin work in the new copy. You can customize this new menu by editing the content in the Text tab, changing the paper size under the Design tab, and customizing with Graphics, Spacing, Layouts and Fonts.